You can look up the content of a status that has been sent. This can be for instantaneous as well as standard alerts. 1. Go to Reports > Alerts > Alerts. 2. From the Lookup alert details panel, enter the alert’s unique ID into the Alert ID field. The content of the alert will be displayed in the Alert details panel at the top. By default, the Smoothwall queues alerts in two minute intervals, and then distributes a merged notification of all alerts. The Smoothwall can be configured to process instantaneous alerts as soon as they were triggered. You can choose to have them delivered via SMS or email. • From the Groups panel, select the group of recipients from the Group name drop down list. 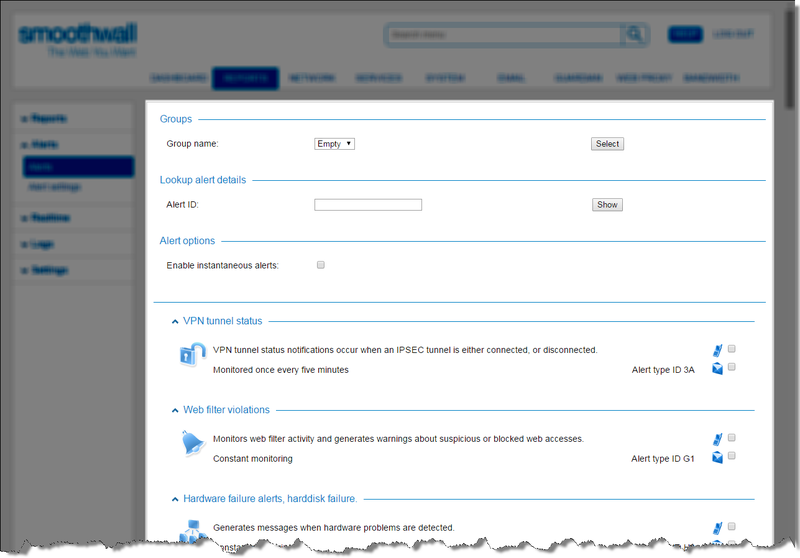 For a detailed description of how to configure groups, see Configuring Alert and Report Groups. • From the Alert options panel, select Enable instantaneous alerts. 3. For each alert you want to send, select the delivery method: (SMS) or . (email).